CanadaVet.com Blog: Dog - A Caveman's Best Friend! We all know that dogs are man’s (and woman’s) best friend. But scientists have recently discovered evidence that this relationship has existed for thousands of years! 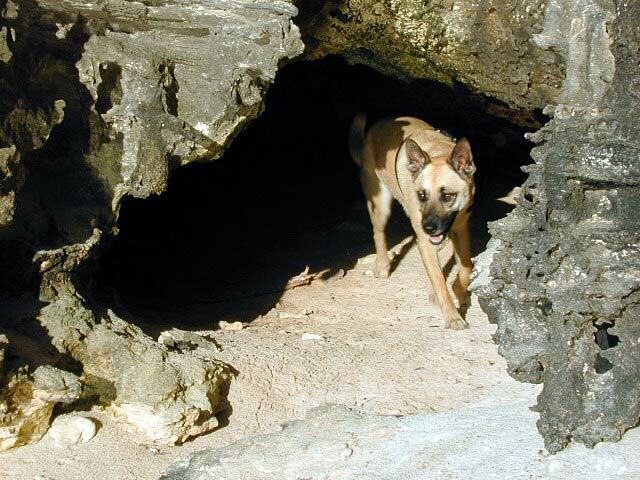 Scientists have recently identified 14 000 year old remains in an inhabited cave in Switzerland as belonging to a domesticated dog – clearly distinguishable from wild wolves, and clearly showing that dogs were part of the caveman family. Imagine the scene – 14,000 years ago, and the cavemen and women are living in the high Swiss alps. The winters are long and cold. Why wouldn’t our loyal best friends be invited into the cave with us, to huddle around the fire, to warm our feet and to share our protection against the harshest elements? In fact, the Australian Aboriginals, who also had domestic dogs in their camps, referred to the harshest winter nights as “three dog nights” – that’s how many dogs you would need to snuggle to keep warm! The relationship would have given immense benefits to both parties. Our doggie friends would have benefited from their relationship with their caveman owners – this would have been a safe place to shelter, the food was better and more reliable (humans’ upright gait gives them a larger range over which to see potential prey and predators and humans’ colour vision gives us better visual discrimination (at least by day)) and our ability to make fire would have kept our dogs warm and safe at night too! Caveman would have benefited, not only from the companionship of a pet and the warmth of a dog to snuggle, but the dogs would have improved sanitation (by cleaning up waste and scraps), acted as guarddogs, using their acute hearing and (most significantly) would have been used to considerable advantage in hunts. In fact, the spread of humanity throughout the world may owe a lot to the pet dog as well. Scientists also think that emigrants from Siberia likely crossed the Bering Strait with dogs in their company, and some experts suggest that use of sled dogs may have been critical to the success of the waves that entered North America roughly 12,000 years ago. These discoveries again underscores the close bond between an owner and their dog. As I lie back on the couch tonight, with my doggy foot warmer, I’ll be remembering that my dogs really are part of my family, and it’s been this way for thousands of years!